Never judge a book by its cover: or a CD by its sleeve: or a singer by their looks. To do any of those would be to risk misleading oneself: and it would be so easy with the cover - as you can see. This is no shrinking violet of a voice: this is a full blooded powerhouse � but more of that anon. The choice of arias takes us from bel canto to Puccini via verismo. Most, but not all, are the acknowledged "big hitters" for the period. So here is the first point to consider. What does this CD contribute to our experience or knowledge of them? To which there are two answers: the one simple and obvious is that for �4.99 you will hear a soloist whom many have not heard previously. The other is that you will hear those arias delivered by a voice of almost raw power. The problem is that in setting herself such "populist" arias there are many other recordings as benchmarks against which she will be judged. The obvious example of that is track 12 Vissi d�arte. There are so many recordings that a comprehensive review would occupy pages of text. So let us take one comparison: and that with the classic Callas recording of 1953 with Tito Gobbi (EMI Classics 7 47175 8). In Scarpia�s study Tosca is lamenting her lot. Callas, with almost rhapsodic support from the La Scala orchestra, sings with almost total clarity of diction and beauty of tone of her questioning doubts. 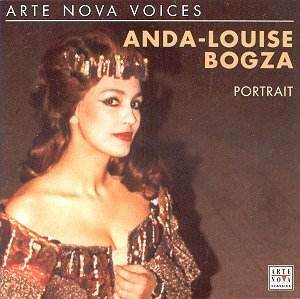 Anda-Louise Bogza matches Callas for power but as the aria progresses her clarity of diction decreases and her doubts seem to recede. On this and other tracks I fear that the interpretation of the role /words is subsumed within the power of delivery. Having chosen Verdi, that master technician of the exploration of human emotions as the basis for the compilation then emotions should be paramount. So let us return to track 1 from Un Ballo in maschera. Amelia, believing her death imminent, expresses her last wish to hold her son. She is without hope. A mournful cello lurks in the background. Rather than the more dramatic quietly delivered Morrò Bogza starts on a resolutely delivered note and progresses from there. The quickish pace and firmness of delivery then disenables her from drawing out the pathos of the wife about to die, on the orders, if not by the hand, of her husband. We move onto Il Trovatore with Ascolta.Tacea la notte and travel seamlessly into Di tale amor che dirsi omitting the intervening exchange with Inez. This is a strong and emotional section of Leonora�s role. With strength required Bogza has just the voice for it whilst a question mark still hangs over her interpretation and tonal contrasts. In Timor di me? (a slightly curious starting point) the higher range is managed without any hint of strain. In Di te! Scordami di te! Leonora sings of her determination to save Manrico and Bogza is entirely believable. On these extracts she produces the liquid gold of her lower register with tone at that level second to none. Pace,pace from La Forza del Destino makes the orchestra more comfortable than their somewhat pedestrian earlier accompaniments. A good spine-tingling start leaving the harp to continue the well paced extract. Tu che le vanità, from Don Carlos, the longest track, starts with a seriously crisp orchestra and excellently phrased undertones of the Inquisition. Sadly this sharpness is not maintained. Meanwhile this aria, Elizabeth�s biggest, demands a wide vocal range, which Bogza meets with just a hint of strain in the highest notes. However this vocal power version gives only a little suggestion of the overwhelming sadness besetting Elizabeth. Aïda follows the same pattern with impassioned delivery in Ritorna vincitor! but did not convince me of the dreadful dichotomy of family ties against love�s desires. The force is reined in for La Wally�s famous aria with consequential refinement of diction and the appearance of stronger tonal contrast. It demonstrates just how effortlessly she sings. Sadly the power is back on for La mamma morte. Then the pendulum swings back again for the heart rending lament of Sola perduta, abbandonata with her lower register producing a rich sound for the realisation of loss and impending death. And just how often is Butterfly portrayed successfully as a sweet 15-year-old innocent? Surely not often and definitely not here where Bogza�s certainty of sound overwhelms questioning youth. So what will happen in the final track In questa Reggia: a "show stopper" of an aria for an icy princess within whom beats a (hidden-and in this case there is no sign of ) sensual woman. The ice here is almost fiery which would send most Turandot�s scurrying away. Bogza is not helped by the omission of the two brief sections of chorus and the concluding lines of Calaf joining her. These leave her coldness exposed with no counterbalance for her rejection of love.